In a certain New England town, it's hard to keep the undead down. It's shocking story continues courtesy of Larry Cohen, a maestro of cinematic horror (the It's Alive trilogy) and writer of police-action thrillers (Best Seller, Maniac Cop), tapping into his senses of the macabre as well as satire in a clever chiller based on characters created by Stephen King. Joining in to bedevil and terrify are Michael Moriarty as an anthropologist asked to write a "bible" for the town's ghastly group, Andrew Duggan as the leader of the townfolk (including June Havoc and Evelyn Keyes) who hide their blood-feasting bent behind sweet exteriors and filmmaker Samuel Fuller in a rare on-screen role as a vampire hunter. For mortals who occasionally like to go to the devil – and come back – A Return to Salem's Lot is one terrific terror trip. OK... I haven't seen this movie since I was a teen. I have to say... it wasn't as good as I remember it being. I mean I still enjoyed it in a cheesy fun sort of way. But it don't hold up compared to Salem's Lot. But I am sure it is also partially because of my taste in movies maturing... as I did find some of the scenes silly now. But for the most part... still enjoy it... glad I have it in my collection. Coil up on the couch and prepare yourself for more action, more danger and more snakes! The giant anacondas are back in the next chapter in the thrilling series, starring David Hasselhoff as Hammett, the ruthless mercenary and snake slayer. In a secret government compound, two mega snakes are undergoing testing by a brilliant scientist, Amanda (Crystal Allen). But when the financier, Murdoch (John Rhys-Davies), pushes the experiments too far, the snakes escape, hungry and heading for civilization. What Hammett doesn't know is that one of the snakes is expecting a litter of slithering offspring. Now the race is on to head off the snakes' unstoppable onslaught before they reach the city. Oh well... what to say about this one. It is not a good movie... though it does have a it's moments here and there with the snake attacks and such. David Hasselhoff is just plain laughable in this movie. I did like Crystal Allen though. Just not sure if that is because she is good or that everyone else in this movie is so bad it made her look better then she actually is. The story itself just didn't keep my interest... I found myself doing other things while pretty much just having this on in the background. Basically ending up just paying any attention to the scenes with the snake. But even with that being said... I find myself with the urge to get part 4 in my next DVD order... how weird is that? This wild comedy is an intoxicating mix of mountain-high hilarity and radical winter sports action! For snowboarders Rick (Jason London – Dazed And Confused), Luke (Zach Galifianakis – Bubble Boy) and their buddies, life at the Bull Mountain ski area is about partying hard, looking for girls and doing anything for a good time! But when the town's founder dies, his son decides to sell the mountain to a sleazy developer (Lee Majors – TV's Six Million Dollar Man) who's intent on turning Bull Mountain into a slick yuppie ski resort! Featuring outrageous stunts by real-life snowboarding champions like Todd Richards, Rio Tahara, Tara Dakides, Devun Walsh and Rob "Sluggo" Boyce – and a red-hot soundtrack – it's an avalanche of laughs as the guys do whatever it takes to save their mountain! This is really no more then an average comedy. There isn't too much here you haven't seen many times over. Though I did get a kick out of the "King of the Mountain" competition. Where snowboarders started on the top of the mountain... with a mug of beer in their hand. Then went down the mountain... holding the mug of beer. Whoever had the most beer left in their mug at the bottom of the mountain wins. This film does have a lot of familiar faces that I know from various TV Shows. A. J. Cook and Zach Galifianakis were both in Tru Calling. Caroline Dhavernas was in Wonderfalls and Off the Map. And then of course there was Lee Majors who was the Six Million Dollar Man. Even with these well known actors... the acting left plenty to be desired. But there is enough fun here to keep you entertained through-out the entire movie. Just not something I see myself re-watching often. 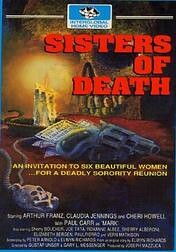 During a sorority initiation ceremony, something horrible goes wrong and one of the new members is accidentally killed. Seven years later, the remaining sorority sisters receive invitations to attend a reunion at an isolated mountain estate. Unbeknownst to any of the women, the resort is owned by the father of the deceased sorority member and he is looking for revenge. This is a movie I got in the Horror Classics: 100 Movie Pack that I got cheap from Mill Creek Entertainment. Unfortunately... but not unexpected... the quality leaves a bit to be desired. The image seemed to have a slight blur to it... and there was a slight hissing to the audio in some scenes. I wasn't too thrilled with the movie itself either. I found my attention drifting away from the movie. Ending up doing other things while the movie played in the background. But while I didn't get much out of the movie itself... I did find I liked the ending quite a bit. I just wish that the movie up till that point was better then what it is. Jennifer Love Hewitt stars in her sexiest role ever as Samantha Horton, a former Texas Homecoming Queen who always relied on her beauty and charm to navigate life, something her beautician mother Cassie (Golden Globe® award winner Cybill Shepherd*) taught her. But when the Horton family finds itself facing financial ruin, Samantha must take a job at a local massage parlor, only to discover it's a front for a high-end call girl operation — one so lucrative, she can't afford to turn it down. And when the parlor is raided, Samantha must either cooperate with police and give up her clients' identities, or lose everything she tried so hard to save. This is a 2010 Lifetime TV Movie... one that spawned a series also starring the lovely Jennifer Love Hewitt. I have been watching the series since it started... but I never seen this movie till now. This movie is apparently based off a true story. I enjoyed the movie quite a bit.... but I definitely prefer the series. Of course Jennifer Love Hewitt looks fabulous... but her character is much more likable in the series then she is in the movie. While a couple of the cast members remained the same from the movie to the series... the majority of them changed. There was other changes in the series as well. But as I said... I personally prefer the series... though that could be because it is what I saw first. It's newborn. It's Alive (Disc 1). And murder is what it knows best! A proud couple's bundle of joy is really a newborn terror in filmmaker Larry Cohen's cautionary cult hit that tapped into environmental fears. The horror grows when multiple child monsters rampage in It's Lives Again (Disc 2/Side A) – and as two brave parents try to stop them by becoming the bait for their spree. The now global terrors are rounded up and relocated to a far-flung island (but not for long!) in It's Alive III: Island of the Alive (Disc 2/Side B). Will a parent's greatest nightmare become the world's greatest fear? Find out...if you dare. The first movie in the It's Alive box set (3 movies on 2 Discs)... This is a film I haven't seen since I was a kid. Which going into it worried me a little. I remember enjoying it back then... so my expectations were up a little. But at the same time I was worried it wouldn't hold up to my memory. While I remembered it to be better then what it was... I still enjoyed this one quite a bit. It is a little slow in spots, but not so much so that it takes away from the enjoyment of the storyline. I enjoyed watching the style this one is in... seldomly getting only slight looks at the mutated infant. Making you use your imagination more then you do for films now a day. If you never seen this movie... I recommend checking it out. This is an Anthology Horror movie I never heard of before. It was suggested to me by a couple friends that said I HAD to see it. Though it is a little different then most anthology horrors I have seen. There is only 2 stories in this one... which I am used to seeing at least 3 in most of the others. Plus there is no wrap-around story to this one. The first story, The Facts In The Case of Mr. Valdemar, has a bit of a slow start. I still enjoyed every minute of it, so this didn't hurt it much at all. I also enjoyed the second story, The Black Cat. This one can be a little on the weird side at times. I was happy to see a favorite actress of mine, Julie Benz (Dexter), has a small part in it. She is young in this movie. So young in fact I almost didn't recognize her. She looked to be in her mid-teens here. Harvey Keitel stars in this second story... and I think he did a great job. I am thrilled I finally got to see this film. Over-all I enjoyed it very much. This special edition DVD has a nice selection of extras. Most of which is on a bonus disc. I only glanced at these extras so far... but they look pretty solid. This is one I feel comfortable recommending. 1600 Pennsylvania Avenue. Not your address, but if you're an American, it is your house. It's the White House, home of the President and site of state dinners and world-shaping decisions. But what if it's also the site of a hushed-up murder in a room just steps from the Oval Office? Who did it — and why? That's what homicide cop Harlan Regis (Wesley Snipes) wants to know. And what you'll discover as Murder at 1600 sweeps you into an exciting mystery thrill-packed with suspects, cover-ups, covert agents, daring action sequences and an overseas crisis that could blow at any instant. 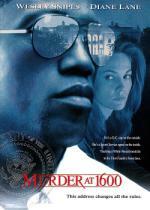 Dwight Little (Marked For Death, Rapid Fire) directs Snipes and a top-notch cast featuring Diane Lane, Alan Alda, Daniel Benzali and Dennis Miller. It's up to Regis to sort through the clues and make sure the killer doesn't get away. It's up to you to make sure this gut-grabbing thriller doesn't get away. I remember seeing this movie years ago when it first came out on VHS. I remember enjoying it back then... but I haven't watched it since. This DVD was in a box full of DVDs that was given to me a couple years back... and I am just now getting the chance to watch it again. This one held up well for me over the years. I still found I enjoyed the movie quite a bit. Unfortunately shortly into the movie I remembered the ending... who the murderer was... even after all these years. But that's ok...it don't take away from the enjoyment. Recommended... if you never seen it.... check it out. A successful physician and family man, John Dolittle (Eddie Murphy) seems to have the world by the tail, until a long-surpressed talent he possessed as a child – the ability to communicate with animals – is suddenly reawakened with a vengeance! now every creature within squalking distance wants the good doctor's advice, unleashing an outrageous chain of events that turns his world upside down! This is part of a box set that contains the first 4 movies in the series. It is a fun movie. There is a lot of laugh out loud moments. Though I must admit that I remember it being a little better then what it actually is. While I did laugh at most of the jokes... some of them did fail. Rodney the guinea pig was a lot of fun. And I liked the drunk monkey. I felt the main storyline with the tiger was good... but think it could have been a little better... as my attention did drift a little here and there. But over-all it is one I would recommend for some family fun. Being the first movie in the set I am surprised at how little extras is added. I would definitely liked to of seen a few more things added. Paul Hogan's hilarious, endearing performance made "Crocodile" Dundee™ the biggest box-office comedy smash of 1986! Michael J. "Crocodile" Dundee (Hogan) is a free-spirited Australian who hunts crocodiles with his bare hands, stares down giant water buffaloes, and drinks mere mortals under the table. But he's about to face the ultimate torture test - a trip to New York City. Beautiful and tenacious reporter Sue Charlton (Linda Kozlowski) gets more than just a story as the "wonder from Down Under" rocks the Big Apple to its core. This is another good comedy that I haven't seen in a very long time. There is many laugh out loud moments here... though I must admit it really don't take off until Mick gets to New York. I mean it is still good before that point... but at least for me... the real comedy is seeing Mick out of his element in the big city. It is definitely another one I would recommend. Though I would have liked to have seen a few extras with it.